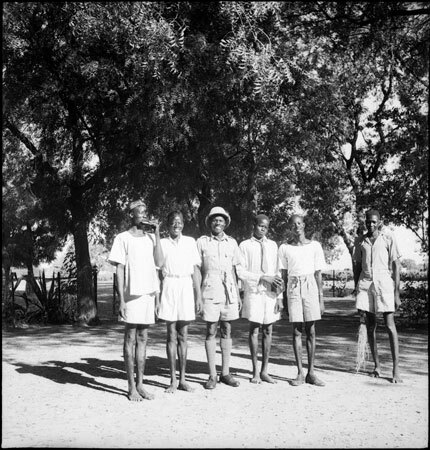 A group portrait of six Dinka youths in European-style clothing, one playing a mouth organ. One is wearing a pith helmet, long socks and shoes, and may have been employed by the administration. Morton, Chris. "Portrait of Dinka youths" Southern Sudan Project (in development). 03 Jan. 2006. Pitt Rivers Museum. <http://southernsudan.prm.ox.ac.uk/details/2005.51.335/>.